A Review of Terminology and Methods. Over the years, there has been considerable debate on how to determine and classify the thermal performance of insulation materials used in electrical power systems equipment and related applications. This disc wound, dry-type transformer shows “winding combs” fabricated from Grade N220 used to support the coil windings. Without question, there are many other terms used as well. However, as a customer of a branded material, it is important to ask and understand what is actually being supplied. This paper reviews the various electrical industry standards established by widely known trade organizations and associations. 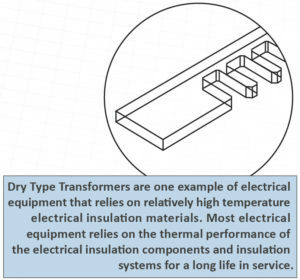 We attempt to educate and illustrate the various test methods used to determine thermal performance specifically for electrical insulation materials. 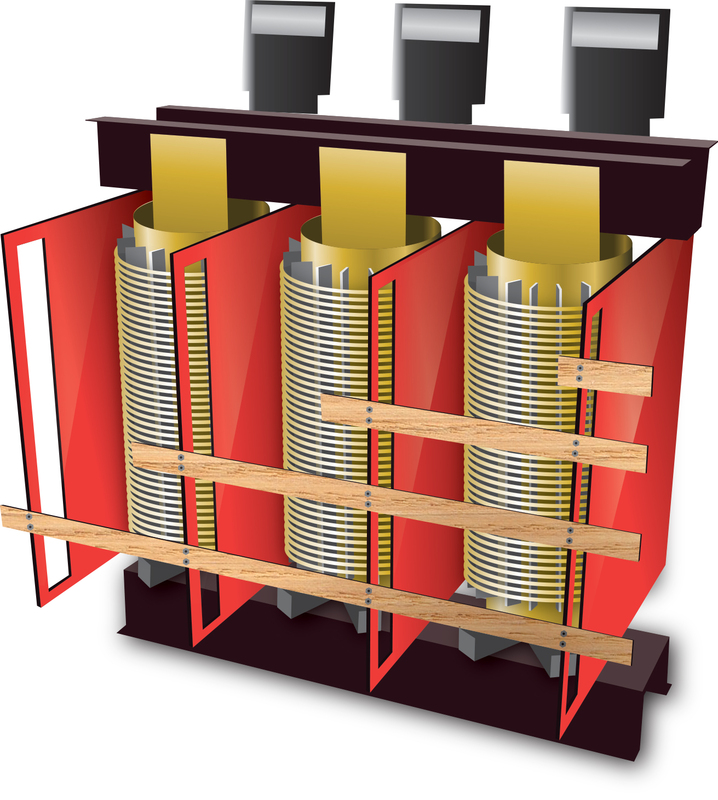 The Gund Company fabricates custom electrical insulating components for power systems equipment including generators, transformers, switchgear, power supplies, electric motors, and related equipment. Insulation material selection can be quite a challenge due to the number of factors that influence insulation system engineering and insulation component design. One key criterion for insulation material selection is the material’s thermal performance. Since it is impractical to test a material in equipment for as long as it is expected to be in service (i.e. 20 years), other methods have been developed in order to determine the thermal performance of electrical insulating material. But, the question remains as to what terms for expressing a material’s thermal performance have meaning. From the design engineer’s perspective, the terms that have meaning should be established by an industry association, an accepted test method, or a specific company’s own internal specifications. Regardless, there needs to be a well-defined test method to establish the consistency of the testing program for use in comparing various materials under design consideration. Without question, there are many other terms used to describe the thermal performance of materials. Unfortunately, some of these terms have no technical meaning established by industry standards or specification. For example, there is no industry definition or standard for “Continuous Operating Temperature”. What does that term mean? How is it tested? How does it apply to design considerations for electrical equipment? A property value for Continuous Operating Temperature really has no meaning unless there is a very specific test method indicated to help determine how that property value was determined. It is safe to say that each industry may have its own terms and its own test methods for determining the thermal performance of various materials used in its designs. However, the electrical industry has established very specific terms and test methods pertaining to rigid electrical insulation laminates. A term reserved for insulating systems as used in specific equipment, and is no longer recognized as a description of the temperature capability of individual insulating materials (IEEE Standard 98-1994). Note: Individual dielectric materials are, however, commonly referred to as Class 90, Class 105, etc. materials. Defined as the relationship between temperature and the time spent at that temperature required to produce such degradation of an electrical insulation that it fails under specified conditions of stress, electric or mechanical, in service or under test (IEEE Standard Dictionary of Electrical and Electronic Terms). The point of failure also referred to as the “thermal life”, is typically considered the time at which the measured property falls below 50% of its original untreated value. An index that allows relative comparisons of the temperature capability of insulating materials or insulation systems based on specified controlled test conditions (IEEE Standard Dictionary of Electrical and Electronic Terms). The temperature above which the material is likely to degrade prematurely. 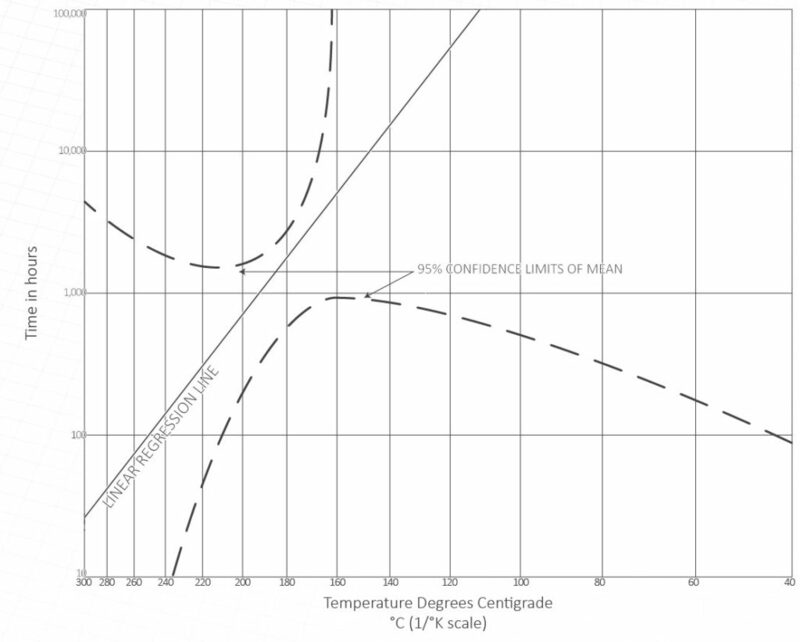 This temperature can be determined by performing a thermal aging comparison against a material known to have acceptable performance at a known temperature. The RTI can also be simply assigned based on the known performance of the generic class of the material. A number which permits comparison of the temperature/time characteristics of an electrical insulation material, or a simple combination of materials, based on the temperature in degrees Celsius which is obtained by extrapolating the Arrhenius plot of life versus temperature to a specified time, usually 20,000 hours. In the electrical industry, there are no other widely accepted terms that define the thermal performance of a material based on an accepted test method for electrical insulation materials. Remember that other industries may have their own standards for defining terms such as “Continuous Operating Temperature”, but unless a specific test method is referenced, such terminology really has no technical meaning. Similarly, some industries may rely on test properties such as the Glass Transition Temperature (Tg) or the Temperature of Degradation (Td), but these tests are not referenced in any IEEE, UL, NEMA, or ASTM test method for electrical insulation materials. 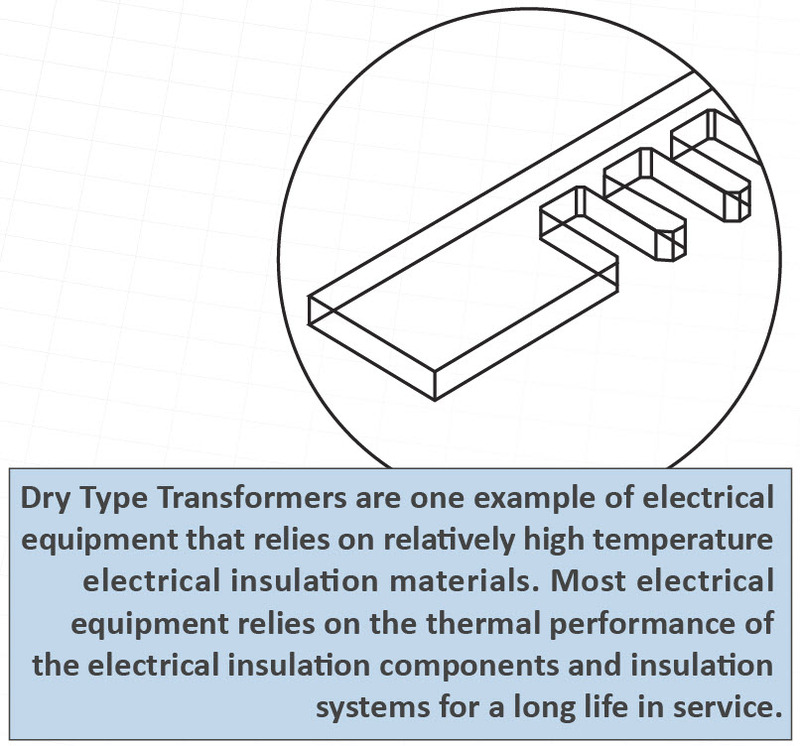 Properties such as Tg or Td may have some meaning, but they do not provide for any reasonable estimation of the life of an electrical insulation material based on mechanical or electrical property retention at a certain temperature over a period of time. Thus, any analysis of the thermal performance of electrical insulation material should be based on the established test methods covered in IEEE, UL, NEMA, and ASTM standards. Today, the Relative Temperature Index is widely accepted by the electrical industry when determining the thermal performance of a material. As seen in the previous definitions, the RTI value can be determined by methods ranging from long-term thermal aging studies to simply assigning values based on the generic class of the material (after chemical analysis to confirm a material belongs in a certain class). The test programs and methods for the determination of thermal performance of insulation materials were developed based on the assumption that heat is the chief cause of insulation degradation. Other factors being equal, thermal degradation is accelerated as the temperature is increased and other mechanical and electrical properties deteriorate with increasing temperature over time. According to ASTM D2304, “Experience has shown that the thermal life is approximately halved for a 10°C increase in exposure temperature. Mstrong>Figure 7-1a provides an example of a thermal life curve also known as a “degradation curve”. An example of an Arrhenius curve is shown in Example 2.
a) A determination of the electrical and mechanical tests to be performed as part of the testing program. The Electrical RTI is typically based on testing dielectric strength. The Mechanical RTI is generally based on testing flexural strength but may include impact or other mechanical properties depending on the material’s end use. b) A determination of the aging temperatures and times for the type of thermal aging study to be completed. For a full aging study, thermal performance at a minimum of three and preferably four temperatures would be tested. ASTM recommends choosing the lowest temperature test to be less than 25 °C above the hottest-spot temperature expected in use so that the thermal life is at least 5,000 hours. Select the highest temperature so that the thermal life is at least 100 hours. If possible, the aging temperatures should differ from each other by at 20 °C, but 10 °C increments are acceptable. No thermal aging testing is required when obtaining the generic RTI’s by this method. If the new material does not match the UL / ANSI “fingerprint” for the generic material, there are several other methods that can be pursued in order to obtain the RTI values. 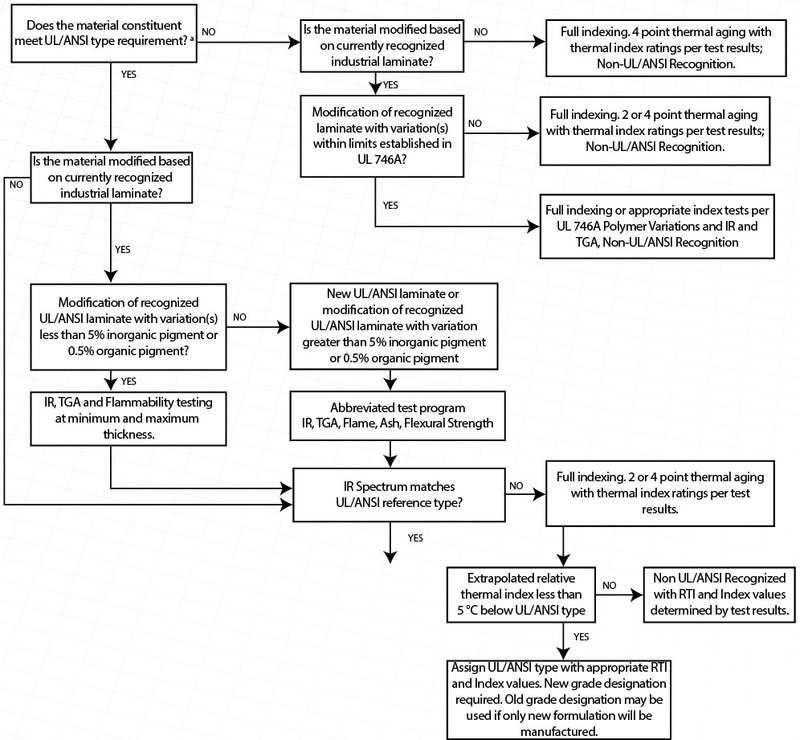 The decision tree shown (Figure 4.1), illustrates the complexity of the possible scenarios that can occur when trying to obtain RTI values (Reference: UL746E). Although generic RTI’s are useful in that they do not require lengthy and costly testing, the RTI values assigned are in many cases below the values that the material could actually achieve if an aging study were to be performed. For example, the generic RTI values for GPO-3 are 105 °C electrical RTI and 140 °C mechanical RTI. If a single point aging test is performed successfully, the 105 °C Electrical RTI can be raised to 120 °C. (Reference UL746E). If a full four-point aging study were to be performed (duration of 5,000 hours minimum), these values could actually be higher yet. Hence, with additional testing, the RTI values assigned become less and less conservative. With the variety of methods used to determine the RTI values, it is easy to see how comparing the Relative Temperature Index of two materials may not be an effective way of comparing thermal performance. It is usually not clear if the RTI’s assigned were based on the more conservative generically assigned values or if they were based on an aging study. One sure way to compare materials is to evaluate them side by side for Thermal Endurance. Comparative aging of “like” materials can be done at one temperature, which per UL, is typically 50°C higher than the known or baseline material’s UL RTI value. 1) One or two temperature point thermal aging of the industrial laminate to 50 percent retention of initial flexural strength property level. (Dielectric strength for G-7, GPO-2, and GPO-3 materials). See Table 6.2 for temperature/time. For control purposes, an individual laminate of the same general UL/ANSI composition having previously been found is to be aged and tested concurrently with the laminate. Therefore, if a particular type or grade of material has an existing RTI electrical of 130 °C, the thermal aging temperature for the comparison test would be 180 °C. Dielectric and/or Flexural Strength testing is conducted periodically over a 21 day period or until the materials have fallen below 50 percent of their original un-aged test values. The test results are plotted versus time in order to generate a thermal life curve. Example 4A (below) provides an illustration of how the thermal life curves can be used to compare the thermal performance of different materials. The Gund Company’s material testing laboratory has tested Grade APO-3 from The Gund Company (UL File # E75481) for thermal endurance using Grade UTR (UL File # E81928) as a control. Because the materials are both UL/ANSI GPO-3 grades, our Grade APO-3 can be tested for a 130 °C electrical RTI and a 160 °C mechanical RTI using the Grade UTR as a control. The electrical RTI testing is done based on testing dielectric strength at 180 °C (50 °C over the control RTI) concurrently for both materials. The mechanical RTI testing is done based on testing flexural strength at 210 °C (50 °C over the control RTI). The results of the mechanical RTI testing are indicated in Figure 4A. Based on these results, The Gund Company certifies that Grade APO-3 meets the UL746 requirements for an RTI mechanical rating of 160 °C. When reviewing the material data sheet properties for any material, it is important to understand the terminology and test methods used to publish the indicated properties. Without industry accepted terminology or test methods indicated on the material data sheet, it is impossible to reliably consider the material indicated properties in design. Unfortunately, many companies publish material properties with no industry accepted terminology or test method on which to base the material’s performance. There is a tremendous risk in relying on property values of questionable origin. Speaking of origin, the problem is amplified with the proliferation of international vendors with little or no testing capability and no association with any internationally accepted standards. Buyers beware, material data may not be worth the paper it is printed on today. The Gund Company’s material testing laboratory can provide thermal performance testing for comparative analysis. Whether for product development, material selection, or material performance comparison, The Gund Company can provide a clearer picture of a material’s performance. In addition to thermal endurance testing, we also have the capability to do several other physical, mechanical, and electrical tests. Let us help you simplify your material selection process. Please complete the form below and we will be in contact with you to discuss your request!